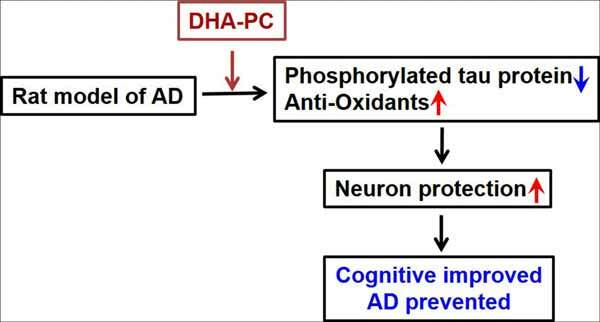 Both Docosahexaenoic acid (DHA) and Phosphatidylcholine (PC) have been shown to halt the pathogenesis of Alzheimer disease (AD) and vascular dementia. This study aimed to investigate the role of DHA-containing PC (DHA-PC) in the improvement of Aβ25-35-induced cognitive deficits in rats. Aβ25-35-induced AD rats were treated for 30 days with DHA-PC, which was extracted from Sthenoteuthis oualaniensis spawns. Cognitive improvement of the AD rats was detected using the Morris water maze (MWM). The results demonstrated that DHA-PC could improve the learning and memory abilities of AD rats in a dose-dependent pattern. Further analyses showed that expression of phosphorylated tau decreased, and the neuronal morphology recovered in brains of DHA-PC-treated AD rats, as compared with mock-treated AD rats. In addition, DHAPC treatment increased the activity of GSH-Px and SOD in the cortex and hippocampus of AD rats. Taken together, these data suggest that DHA-PC is able to improve the cognitive deficits in AD rats, probably through decreasing the phosphorylation of tau in the cortex and hippocampus CA1 area, and increasing the GSH-Px and SOD activities in the brain of AD rats. AD rats, cognitive improvement, DHA-PC, GSH-Px, Tau phosphorylation. 7166 Baotong West Street, Key Lab of Applied Pharmacology in Universities of Shandong, Department of Pharmacology, Weifang Medical University, Weifang 261053, China.